In part 1 of this series, we discussed the where of preparing for what is being billed as the Great North American Solar Eclipse of 2017. This is an event not to be missed if you can swing it. The next time a total solar eclipse will occur over the Tetons will be in the year 2252, so this is a unique convergence indeed. To experience up to two minutes and 40 seconds of one of the great celestial wonders of our time, it will be necessary to be along the 60-70 mile-wide path of totality, which will sweep the continental US on Monday, August 21, 2017, beginning in Oregon and ending in South Carolina. 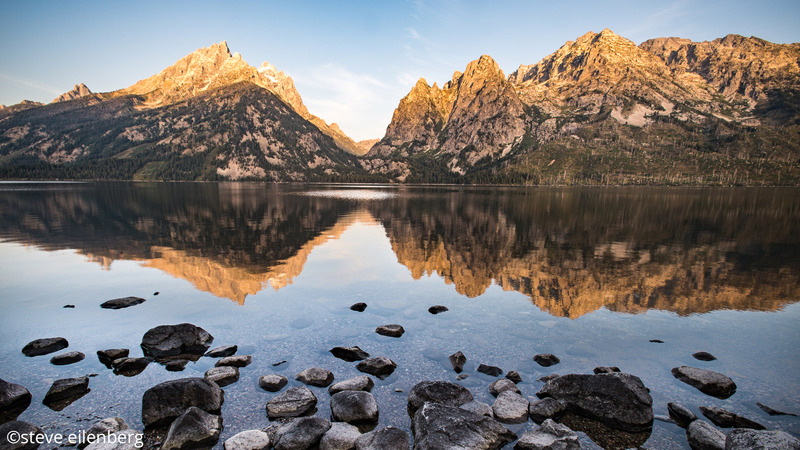 My husband Steve and I, with two friends, will be in a particularly beautiful spot to experience and photograph the eclipse, Grand Teton National Park. In Part 2 of this series, we discussed the need for some specialized equipment to safely view and shoot the partial eclipse run up to and denouement of the big event. Fortunately, these 2 essential items need not be expensive to be effective. The two absolute musts are eclipse glasses for your eyes and a solar filter for your camera. Only during the brief phase of totality will these not be necessary. The lunar equivalent of a wide angle shot of the eclipse, where the moon is an element, but not the subject of the shot. Some general considerations relevant to this eclipse, at least in Wyoming: The partial eclipse will start at 10:16 am. We need to be in position with adequate time to set up, at least an hour before that. The total eclipse will happen near midday at 11:36 am. In a remote area like Jackson, there are few roads. There is likely to be considerable traffic. After the total eclipse, the second period of partial eclipse will take us to 1 pm, meaning hours in the sun. Cloudy or not, that means a lot of time in sunlight. The temperature in summer is usually hot by that hour. For clothing, think about adequate skin coverage, as well as flexibility for variable temperatures, which means layers. For sun protection, sunscreen on exposed skin and a hat are essential.
. My husband will be utilizing Nikon’s equivalent, a Nikkor 80–400mm lens. Photographing the eclipsed sun requires a stable camera platform. Use the tallest and strongest tripod you can get your hands on. The sun will be relatively high in the sky during mid afternoon. The camera will be tilted way up at a high angle. A ball head that allows this amount of movement is a good choice. Before committing to your combination of tripod and head, check to be sure it can position the camera and lens at an angle that will cover that section of sky. Want to know where the sun will be? The $9.99 PhotoPills app on my iPhone shows the sun will be at about a 50° angle in the sky. Straight up is 90º. That angle should be easy to do with my Acratech ball head. Here’s a tip: Extend the tripod’s legs so the viewfinder can be used standing up. Squatting is difficult and can lead to bumping your setup. Also, it’s not good for the back. Be certain to place the appropriate solar filter over the lens before framing the sun at about same time as the eclipse in your area. The screen on the back of the camera will be difficult to see. I plan on using my HoodLoupe to see results on my camera’s back. It is very important to practice. On my first trial run outside, I immediately saw how difficult it is to accurately locate the sun, so I have ordered a new-to-me item called a sun finder. The one I ordered is a 3-D printed $12.50 item, from Shapeways, called a Solar Alignment Finder with hot shoe foot. Although I haven’t used one of these before, the idea sounds analogous to a gunsight, although how you use this is different. One aims the lens toward the sun, with the sun finder in the hot shoe of the camera, until light coming through a small hole at one end shines into the center of a small screen on the other end, thereby ensuring that the camera is aimed at the sun without you having to try to locate it through the solar filtered lens. If you have ever photographed the moon, you know it can be difficult to achieve solid, motionless support at a steep angle with a long lens. I suggest practicing taking moon shots. Here’s another consideration. DSLR cameras have a mirror to reflect the scene from the lens to the optical viewfinder. The mirror pops up, out of the way just before the shutter opens. That mirror movement or slap can cause enough vibration to add blur to the photo. Consider locking it up to minimize vibration. Another way to prevent both mirror slap and any vibration that your finger on the shutter button might cause, use a remote release that electronically activates the shutter. Alternatively, use your camera’s self-timer function. My Fujifilm X–T2 is mirrorless, so mirror slap is not an issue. It is with Steve’s Nikon D500. A lunar eclipse? Not exactly…I was shooting through tall eucalyptus trees behind my house. The moon’s trajectory and a little rustling of the branches by a light wind would periodically cast a “shadow” of out of focus tree branches in the foreground over the moon, producing this effect. In Part 4, our final pre-eclipse post, we’ll consider specific photographic parameters and strategies to consider for the big day. In the meantime, don’t delay in ordering eclipse glasses, solar filters, a sun finder, or any other equipment you may want to use on August 21, 2017. Practice at night shooting the moon. As I mentioned earlier it’s a great way to gain experience, it’s safe to do while you await the arrival of your eclipse gear and, most of all, it’s a lot of fun. Marie Tartar is an insatiable traveler, diver, hiker and photographer.She is one half of the photographic partnership of San Diego-based Aperture Photo Arts (APA).Along with her husband, Steve Eilenberg, she explores the world photographically, on foot and by fin, specializing in underwater, landscape, wildlife, travel and architectural photography. Her images have been exhibited at the La Jolla Athenaeum, San Diego Natural History Museum, Oceanside Museum of Art, Birch Aquarium and the Smithsonian National Museum of Natural History.See more work at www.aperturephotoarts.com. Even with my Gitzo tripod’s legs full extended, I cannot get under the eyepice comfortably. The angle of the sun in my area will be about 66 degrees. Do you have any idea on how I can comfortable utilize my Tripod vis-a-vis the eyepiece on the camera at that high angle. I’ve thought about putting the tripod on a table, but that may not be the best idea. I also tried to purchase a Nikon right angle eyepiece but everyone is sold out. Practicing with my DayStar solar filter, it was impossible to find the sun in the blinding light. The next day, I used a windbreaker to drape over the camera and myself to block out the light. That worked great. For the next eclipse in April 2024, I’ll buy a darkcloth; B&H has one that’s silver reflective on one side and black on the other.